Story: Allen and Annie Bracken had just found out that they were having twins. On their way from the hospital they were taken by a creed spaceship where Zoyvod took one of the fertilized eggs in Annie and send them back on the ground. While the Brackens were on Earth with what would become Pitt's brother Timmy, Zoyvod recombined his genetic structure with the fertilized egg that would become Pitt . On the Creed Imperial stronghold the egg grew in a gestation tank, until the creature unexpectedly woke and broke out. He was ultimately caught and Wroth killed him, or so he believed. Quagg who was supposed to get rid of the body was attacked by the creature while flying the corpse dumping grounds. In the fight, the creature was blasted out thru the door of the shuttle they were flying in . On the ground the creature clawed its way out of the dumping ground  and lived in the wilds until Zoyvod send a team out to retrieved him. Quagg and his team did retrieve the creature, but only Quagg survived the mission . The creature was trained by Quagg and given the name Pitt. For years he worked as Zoyvod's assassin warrior [21,22] until an attack on the planet Chakra where someone named the Seer melded the consciousness of the child Jereb with Pitt . The merger apparently changed Pitt, turning him into a fugitive. Eventually he ended up on Earth . When Pitt entered Earth, he materialized in a New York subway near Timmy and saved him and his grandfather from muggers . Immediately after, he disappeared into the city drifting around while trying to adapt to the new world [1-3]. On Earth he was followed by creed. Timmy, having a genetic structure similar to Pitt, was attacked instead of Pitt, making Timmy and Pitt meet again. This was also the first time Rai-Kee met Pitt. During the fight, Jereb left Pitt and entered Timmy's head, making him able to defeat Zoyvod [3-5]. After the fight Timmy was kidnapped by the creed, making Pitt team up with Axiom. Pitt's half brother Wroth was working with Professor Holdsworth of Axium. Holdsworth wanted the power in Timmy and Wroth wanted Pitt. The plan was foiled, what happened to Holdsworth was not revealed but Wroth got away [6-8]. He returned later and was defeated by Zoyvod who took over Pitt's body for a short while [11-12]. Due to the war between the Creed and the Cenobite, Pitt would have been attacked by the Cenobite, had they found him on Earth. The Cenobite Eurial therefore hid him in Shimmerspace until they were gone . While hidden in Shimmerspace, Pitt met Jereb again. In Shimmerspace, Jereb could see all time at once, past present and future. He told Pitt some of the things that would happen to him. Pitt was only in Shimmerspace very shortly but when he came out, five years had passed on Earth . While Pitt was in Shimmerspace, Guileys had created Pitt clones one of which was send to steal some alien artifacts from a military installation . For this, US army sent both troops and their best warrior Captain Curtis to kill Pitt. They only succeeded in killing Captain Curtis and US soldiers, and Pitt went to the White House where he killed Clinton's double on the lawn [17-19]. Pitt somehow found out about Guileys being behind it all and went to Crossbow Technologies building where he killed Guileys . 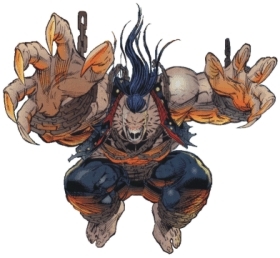 Pitt was last seen when he defeated the demon Urgral Thul . Skills & abilities: Super strength, enhanced healing, limited psychic powers (mind reading).